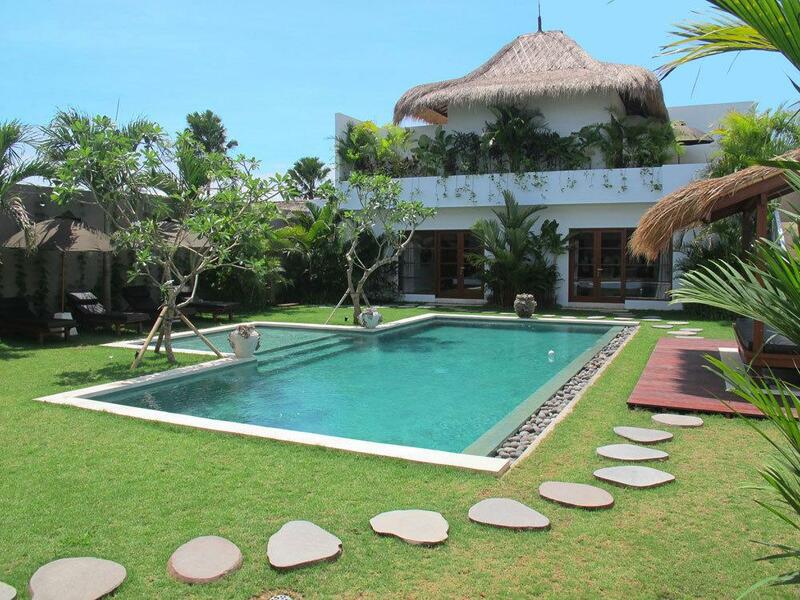 Villa Kalimaya is a group of four exclusive, fully staffed luxury villas located in the heart Seminyak, the best and most convenient location Bali has to offer. 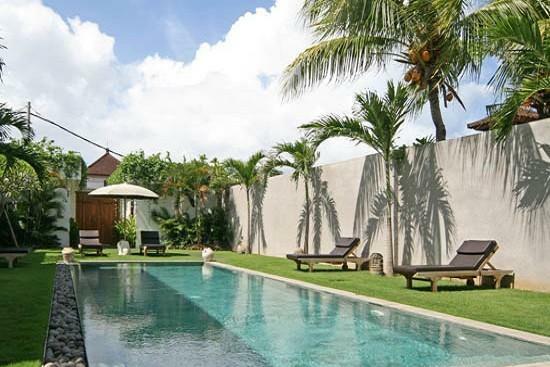 Tucked away in the sanctuary of a peaceful lane, offering 24-hour security, these beautifully appointed individual private villas, which can be rented in any combination from two to 12 bedrooms, are just metres away from Bali’s most popular beaches and hippest bars – such as Ku de Ta, Potato Head, W Hotel – and almost next door to Seminyak Square and the area’s ultra-chic shopping district. 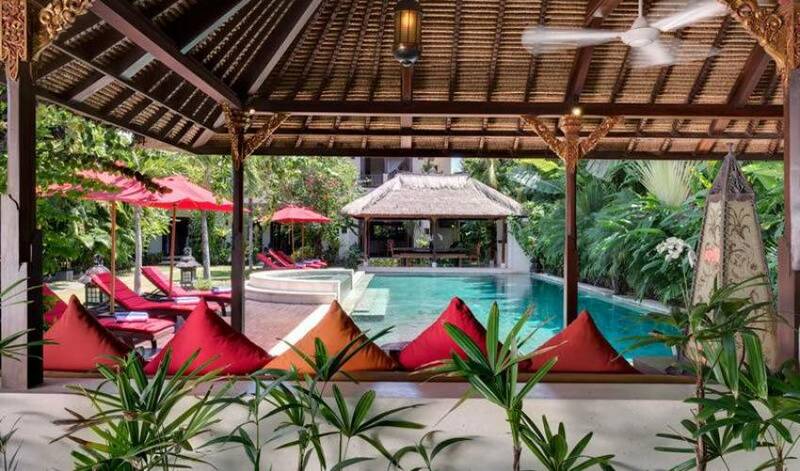 This Luxury Seminyak Villa is a true oasis – a stately villa offering a rental choice of either four or five bedrooms (with an additional room which can accommodate one adult or two children), set within a sprawling tropical Balinese garden yet within walking distance of bustling Seminyak. The villa is a perfect example of how a flair for interior decoration and keen attention to detail can combine to create a perfectly balanced home, with an abundance of indoor and outdoor spaces for gatherings and get-togethers, whether they be grand occasions or something more intimate. And there is no shortage of cosy niches, providing plenty of options for more private moments. 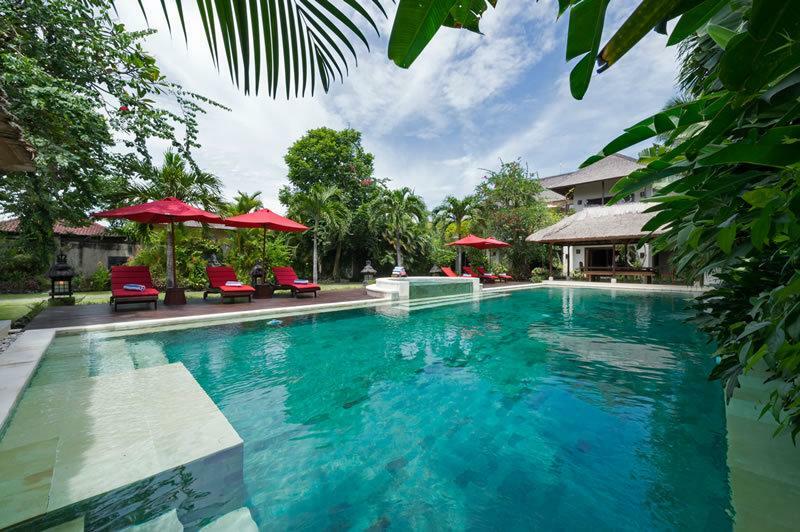 The main two-storey villa, with lovely vistas over the garden with its enormous pool and spa, houses the kitchen, dining room and two living and entertainment rooms – one upstairs and one downstairs – ensuring that there are ample places for guests to relax and unwind. Two king-size bedrooms and a room opposite with two single beds make the main house an ideal location for families. 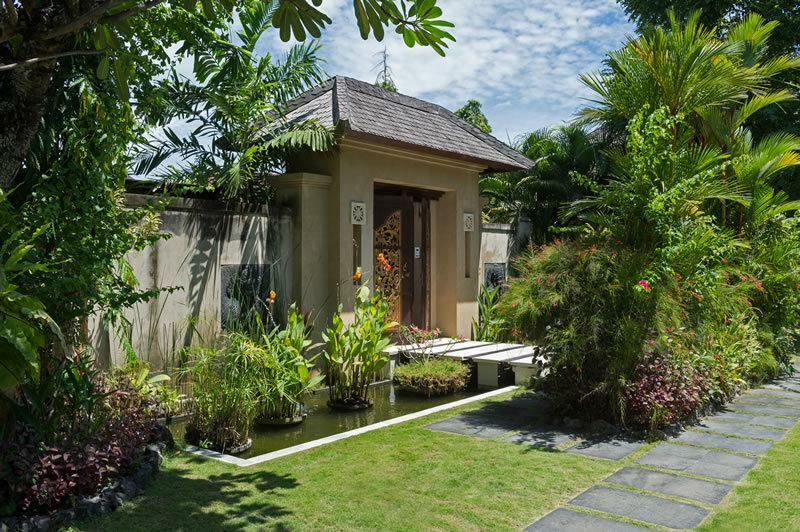 Three additional pavilions are discreetly situated throughout the garden, each housing a magnificently appointed king-size bedroom, with tropical indoor/outdoor ensuite. The two spacious poolside balés, one with an adjoining infrared sauna, provide the ideal place to relax after a dip. 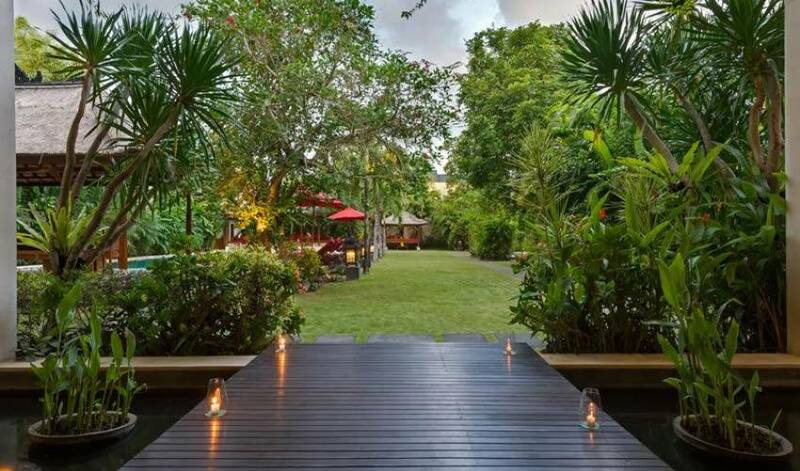 An additional balé nestled within the garden is the ultimate spot to while away lazy days. The fully air conditioned ground floor of the main house features a well-equipped kitchen and dining room with seating for ten. The upstairs first floor, also with air conditioning, opens to a comfortable lounge and entertainment area, which has a back wall made entirely from glass behind which sits a tranquil waterfall. By closing the curtains, the upstairs entertainment area can be totally darkened to give a full cinema experience or opened up to become a light and airy space in which to read a book or watch a DVD. The upstairs balcony is the perfect place to sit under the shade of an umbrella and enjoy an alfresco lunch with friends. 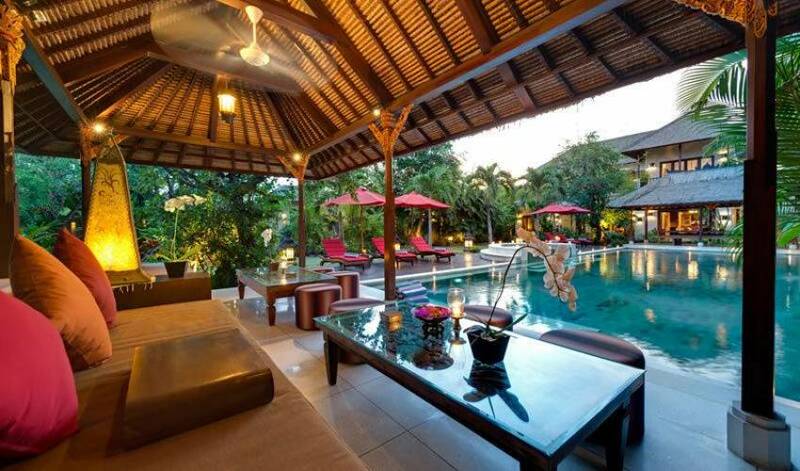 Or, as the sun goes down it is the ideal spot to share a cocktail and marvel at a spectacular Bali sunset. 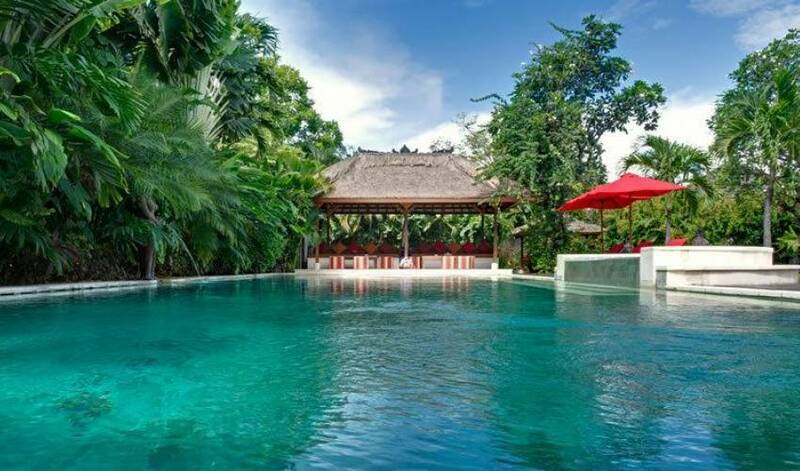 The covered balé by the pool and spa area with its magnificent solid teak table is a great place to enjoy a meal at any time of the day, whether it be fresh fruit for breakfast or a traditional Balinese banquet by moonlight. The table can accommodate up to twenty guests and an adjoining bar makes it the ideal location for canapés and drinks or a celebratory feast. 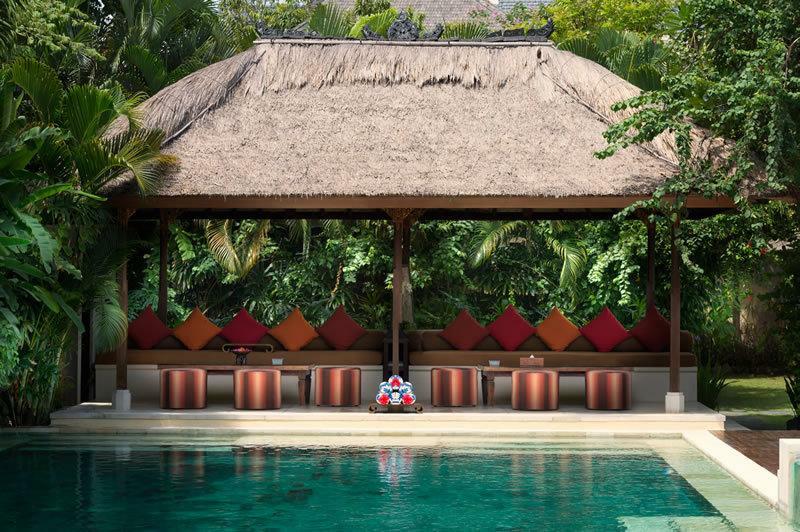 The smaller balé at the opposite side of the pool, with its comfortable loungers and cushions is a wonderful spot to read a book or magazine and watch the kids splash about in the pool. 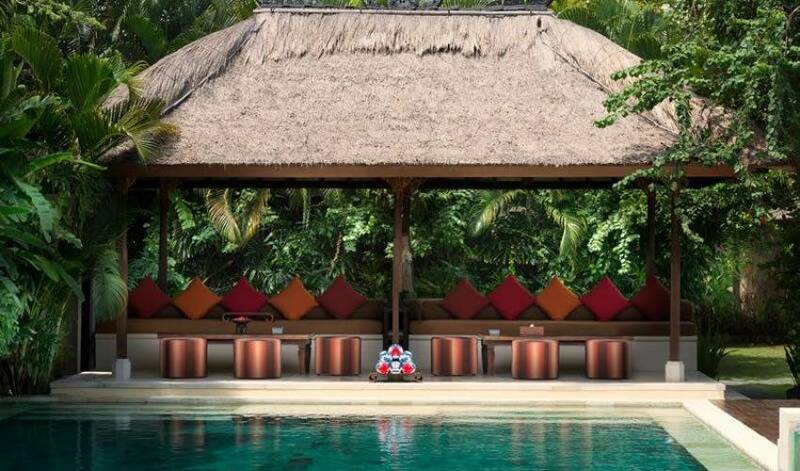 The pool and spa area are also surrounded by sun loungers and delightfully shady umbrellas: perfect for relaxing! 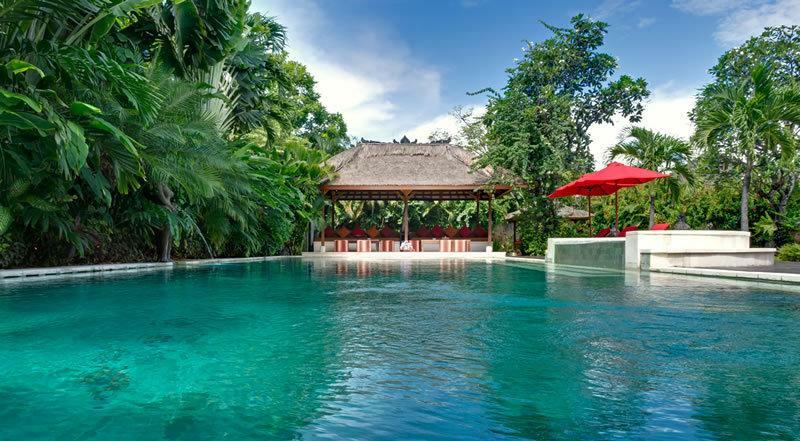 The discreet balé behind the pool is just the place for an afternoon snooze, or even better, ask the staff to arrange a masseur to come and have a traditional Balinese massage out in the fresh air. The spacious and tastefully decorated king-size master bedroom is located on the second floor of the main house and boasts a magnificent four-poster canopied bed, chaise lounge and a marble ensuite with a jacuzzi tub. For families, there is a bedroom conveniently located across the hallway with two single beds. This room is ideal for two children, or the beds may be joined together to accommodate one adult. A second bedroom in the downstairs of the main house features a king-size four-poster canopied bed and is delightfully private, opening onto a small bridge which leads directly to the garden. 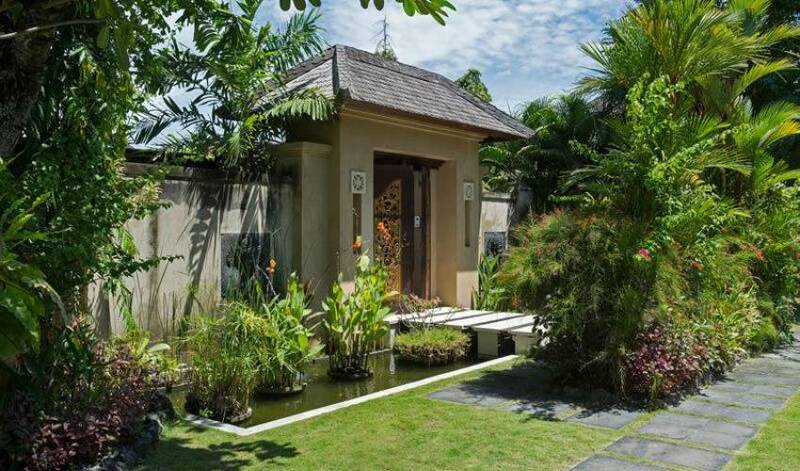 It features a tropical indoor/outdoor ensuite with stand-alone bathtub and rain shower. Each of the three pavilions feature romantic custom made king-size four-poster canopied beds and tropical ensuites featuring oversized bathtubs and rain showers. 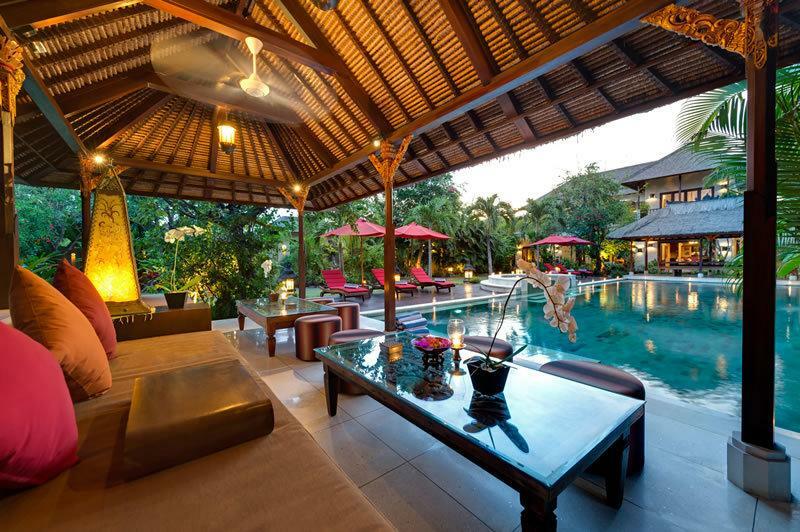 These pavilions, perfect for guests seeking an intimate and private space, are light and airy. 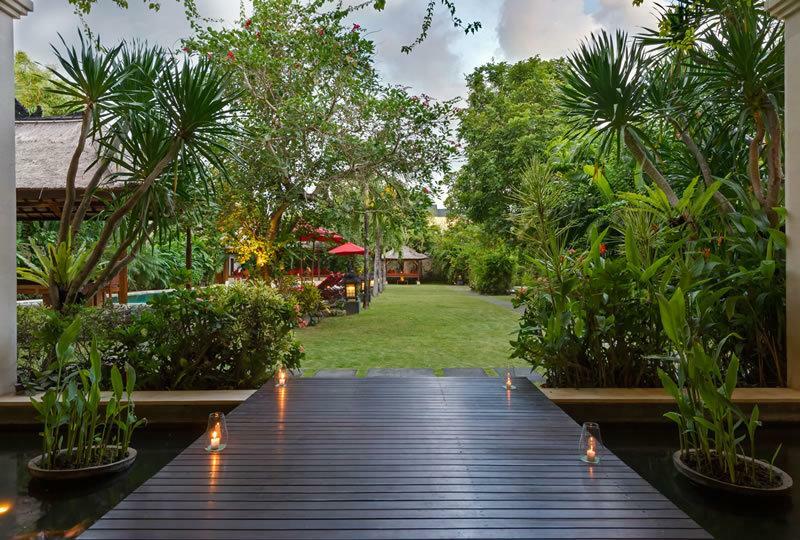 They are each nestled within the expansive garden and if you didn’t know any better, you’d think you had the villa to yourself. All of the five well-appointed bedrooms include satellite TV and DVD players, a safe and a bar fridge. 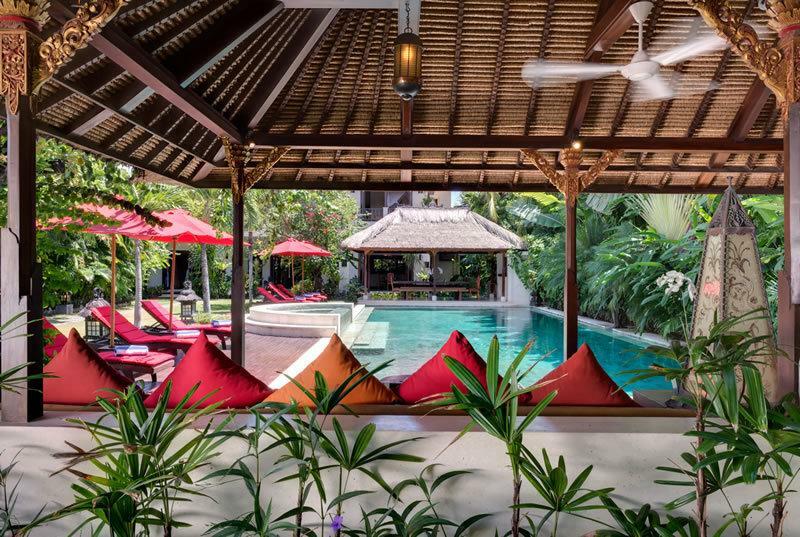 The Villa is located in the absolute heart of Seminyak, within short walking distance from some of the best known and iconic restaurants and bars on the island. Ku De Ta and Potato Head are literally at your doorstep and it’s just a stroll to the gorgeous beachside restaurant La Lucciola and the hot new dining favourite with both locals and expats, Petitenget. Take some time and explore some of the world-class boutiques and fabulous contemporary art galleries. I just wanted to send you both an email to let you know how enjoyable our stay at Kalimaya 1 was. As my first villa experience it was beyond my expectations. Yani & the staff were super friendly, accommodating and welcoming. 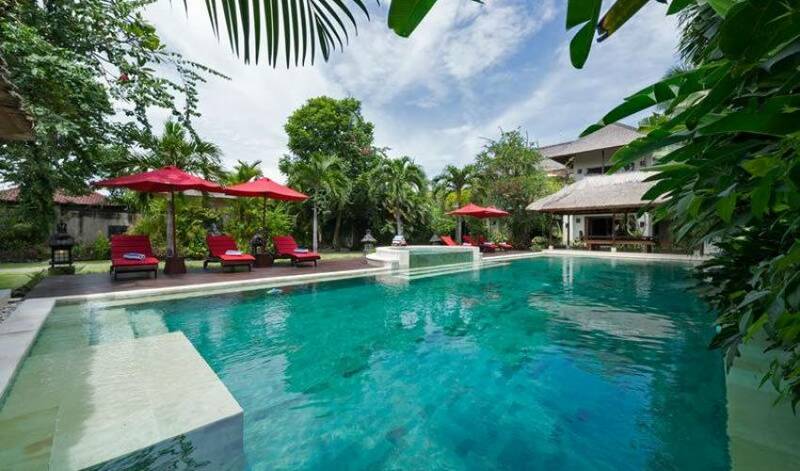 Several of our friends are even thinking about booking the villa for their upcoming special occasions. The house was so clean and comfortable and all those who stayed there with us were so impressed. 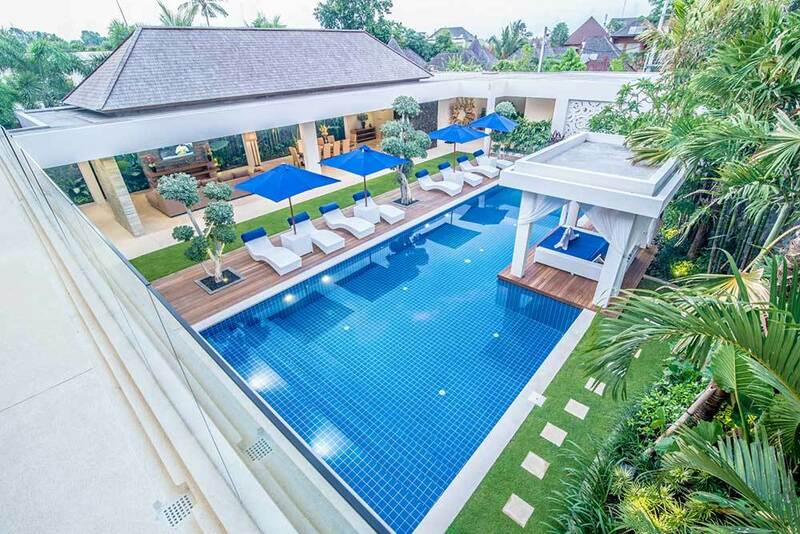 I would definitely recommend the villa to our friends and family.